We had a BLAST this year at Brighton Tattoo Convention's 10th anniversary! We tattooed, we celebrated our own (1st) birthday for Skinned Alive Tattoo, saw old friends and made new ones! Trud Tattooist donned his hat as investigative reporter to bring you the juicy facts about the secret lives of tattooists. Please watch, share, like, subscribe to our Youtube Channel, and keep Brighton INKY! Ink Spot Interview With Dotwork Damian. My name is dotwork damian and I tattoo at a shop I opened with Reverend Trudgill called skinned alive tattoo in Brighton. 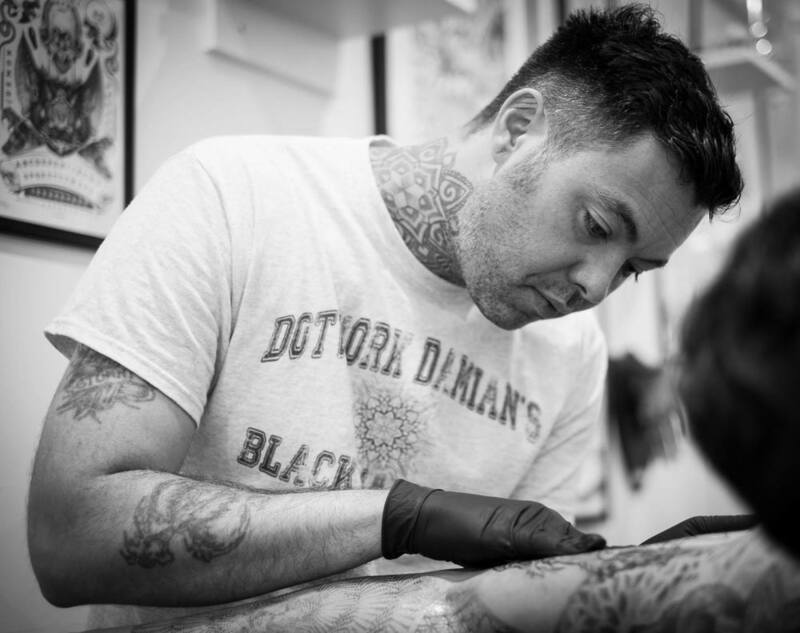 I started tattooing in portsmouth simply because of its long history of tattooing. I largely started tattooing on military personnel and football hooligans. But when my son Luca was born I wanted to move to a more rural location to raise a family, so I moved just outside of Brighton, upon which I started working within the city of Brighton for 5 years, and expanding my skill set and building up a loyal following of customers who are as passionate about progressive tattooing as I am. My work is a combination of pointilism and realism, so to put it simply “Dot Realism”. Inspiration comes from a variety of places. I see geometric type patterns everywhere I look so it’s hard not to be inspired to constantly want to constantly progress with new designs and pattern layouts. Other than tattooing and art, I obviously like to spend time with the family because that’s genuinely the most important aspect of my life. I also like to spend time staying fit through Kickboxing, it’s a good discipline whilst staying healthy and having fun all at once. My main inspiration and person I look up to Xed le Hed mainly for the reason that he was the pioneer of dotwork which was a new style being perfected. This led me to want to attempt my own rendition of that style and take it to the next step by making my own mark on the medium. The perfect customer for me is someone that is always open to something different, or brings me something of reference that I am excited to do. It’s a collective task upon which we can get a good looking result with both people represented. You can find me in the new shop “Skinned Alive Tattoo” 24 Church Street, right in the centre of Brighton. To see my tattoos, artwork and such, just search for “Dotwork Damian” on instagram, and also check out our new shop “Skinned Alive Tattoo” on instagram for updates from myself, Trud Tattooist and some new up and coming tattoo artists.